Beat the cheese with a spatula until creamy then stir in the vanillamayonnaise and a squeeze of lemon juice. Lay 2 slices of salmon side by side on a parchment-lined tray to forma rectangle measuring approximately 5x10cm. 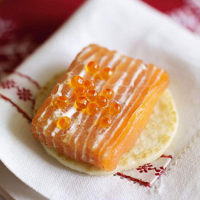 Using a small paletteknife or spatula, spread a thin layer of the mayonnaise and creamcheese mixture on top of the salmon. Lay another 2 slices of salmonon top and spread more mayonnaise and soft cheese on the newlayer. Repeat this process until you have 10 layers of salmon. Loosely cover the terrine with clingfilm and place in the freezer for 2 hours or overnight. Remove the terrine from the freezer and, using a very sharp knife, trim it into a neat rectangle (dip the knife into hot water to make cutting easier). Slice the terrine into 8 even slices. Cut the slices in half and place on the blinis. Garnish with half a teaspoon of caviar.